Do you need an Email Marketing or Marketing Automation Tool? Do You Need An Email Marketing or a Marketing Automation Tool? Email marketing tools are typically inexpensive and marketing automation tools are generally very expensive. So which one do you need? Do you need to invest $500 per month for a great marketing automation tool, or $50 per month for a good email marketing tool? We love to talk about the possibility of one-to-one communication with our target audience in this age of social media but who are we kidding?! One-to-one communication is not possible with a large audience! But what is possible is to use some level of automation to help to improve communication with your audience and, through these interactions, we can identify the most relevant prospects, that is the people who we are more likely to engage in one-to-one communication with. Email marketing tools provide some level of automation. So when do you cross the line and need a marketing automation tool? Well, you’re here to find and out so we are going to tell you!! What Functionality is Typically Provided by an Email Marketing Tool? 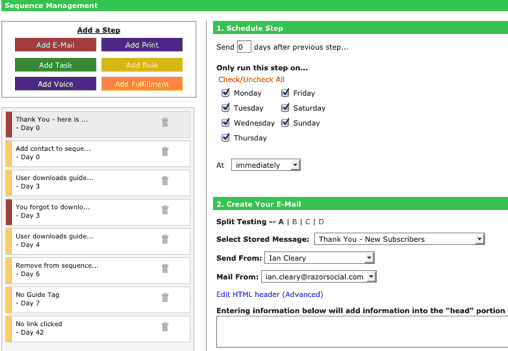 Basic email automation, for example, send an automated series of emails to new subscribers. Over 600 email marketing templates that you can use as part of your subscription. All this functionality is available with AWeber at prices that start at $19 per month and go up as you build your subscriber numbers. So, it’s very affordable and includes a lot of great functionality. What Functionality is Typically Provided by a Marketing Automation Tool? A marketing automation tool generally has all the email marketing functionality mentioned above, plus a lot more. CRM (customer relationship management) database – All contact records are stored in a CRM database. There may also be some integration to third-party CRM databases to allow for synchronization of data between them. An example tool in this area is Ontraport. Membership site – If you want to create a a membership site, you can use their WordPress plugin that manages all the registration, logins, restricted access etc. Payment integration – Through your landing pages, you can integrate with system such as PayPal and Stripe to easily collect payments. Here is an example of a ‘sequence’ you can up with Ontraport. A sequence is series of actions that are automatically performed based on the events that take place. You can build up quite complicated sequences to help automate your lead nurturing. When Do You Need an Email Marketing Tool Versus a Marketing Automation Tool? When you start building your list, you need to start off with an email marketing tool. It’s typically too expensive to start with a marketing automation tool and, without a decent-sized list, you’re not going to benefit too much. The move to an email marketing tool should generally happen when you want to make money from your list, and when you’ve grown your list to a reasonable size. It’s hard to say what a reasonable size is, because it really depends on your business, but you’ll probably have at least a couple of thousand subscribers. Also, ideally, you would move to a marketing automation tool just before you really need it! You sell different products or services to different demographics so you need to target them differently. Depending on the product/service you sell, your website visitors may not yet be ready to buy from you. But that doesn’t mean they never will be. Over time, you can identify who the real prospects are and then focus your attention on selling those. This can be done manually or it can be done through a marketing automation tool. You just need to figure out the best time to make that investment! 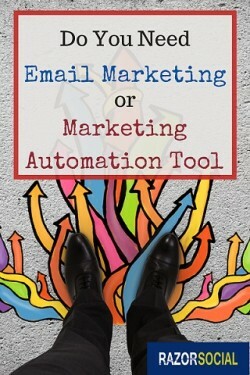 Do you use an email marketing or marketing automation tool? What is your experience of it? I’d love to hear your opinion below.